Does all that the 2-canister fluoride, chlorine unit does, plus adds extra protection against both chemical and organic contaminants, including pharmaceuticals. 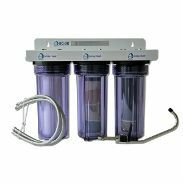 This is a 3-canister Countertop FLUORIDE Water Filter for Fluoride, Chlorine and has extra protection from wide spectrum of chemical and organic contaminants including pharmaceuticals, drugs, hormones and MTBE. The COUNTERTOP Fluoride Water Filter version NEEDS NO PLUMBER. A diverter screws onto the end of any (non-sprayer) kitchen faucet. To filter water, you pull out a tab on the diverter. The difference from the 2-canister FLUORIDE PLUS filter is an extra canister doubling up on the amount of kdf and carbon. This delivers a higher level of protection from the wide spectrum of chemical AND organic contaminants like drugs. We do not recommend one fluoride-filtering material over the other. We offer both because they both do well. Sometimes people ask what is the best filter. If you are in a municipality with chlorine and fluoride, but not chloramines, this is the best kitchen filter. 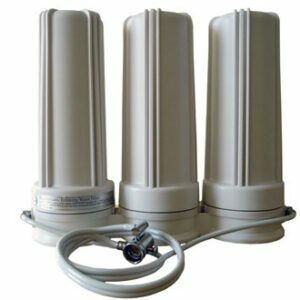 This Countertop Fluoride Water Filter is a good choice if you are concerned that your municipality will later switch to chloramines, which calls for a 3-canister kitchen filter. Good choice if you want more flexibility going forward if what is in your water changes. As with all of our kitchen canister filters, you can swap for different types of filter cartridges later if needed. For example if your municipality later added chloramine, you could get a chloramine cartridge for this unit. Since many municipalities are moving to chloramine, that’s a good reason to get a 3-canister now. This Countertop Fluoride Water Filter is designed for municipal systems with fluoride and chlorine – when you want extra broad-spectrum protection from constant or occasional highs in chemical and/or organic contaminants and heavy metals. Could be right for some well water, but you should get your water tested first so we know what to recommend. The idea is that they work on all the categories of contaminants, with double protection on the categories of chemical and organic contamination. To see a larger sample list of contaminants filtered, see What Is Filtered? . This is a multi-stage filter system. All filter materials have been certified by the NSF. For the third cartridge, we recommend the wide-spectrum option with cyst + microfiber filtration added. * The second canister (middle) has a sediment filter and removes fluoride. * Water flow is excellent. * Bacteria cannot grow in the carbon because of copper-zinc kdf. * The EPA has certified KDF as releasing nothing harmful into the water. The EPA has certified KDF as compliant with Standards 61 & 42. For more information about drugs in the water, AND TO SEE A VIDEO, click on: Drugs in the Water and on Pharmaceutical Water . Click here to learn about Water Filter Tests & Certifications.